ELLY AND AARGH! 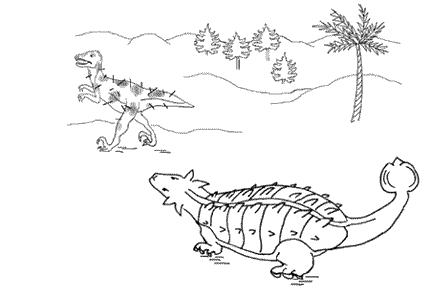 An easy story about dinosaurs: read online, print the free colouring book or download the e-book. Four young dinosaurs were having a race. It wasn't a running race. 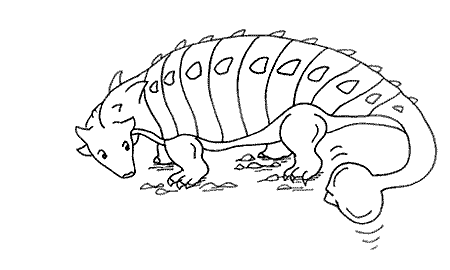 They were ankylosaurs, which meant that they were covered with huge plates of bony armour. The armour was so heavy that they could only waddle. All the same, they could waddle quite fast. And Elly was determined to beat her three brothers. She reached the river just ahead of them. "I won!" she shouted. She wagged her tail in triumph. "Ow! Ow! OW!" cried her three brothers behind her. Elly looked around and saw them lying in a heap. "Your tail happened to us," groaned Lenny. "You wagged it again," moaned Kenny. "It knocked us over!" croaked Benny. "My tail knocked you over?" Elly was sure her tail hadn't done anything of the sort. She wagged it again to check. "NO! Don't wag your tail!" shrieked her brothers. "Why not?" demanded Elly. "What's wrong with my tail?" "It's a lovely tail," said Kenny. "It's just not the same as our tails," said Benny. "It's got a great big club on the end of it!" said Lenny. Elly looked at her brothers' tails. They were slender and pointed at the end, like her mother's and her father's tails. She twisted her head round to look at her own tail. But she couldn't twist far enough to see it properly. "It looks fine to me," she said. "It is fine," said Lenny. "It's a very special tail." "Just don't wag it!" pleaded Benny. This wasn't easy for Elly. When she was happy, she wagged her tail. 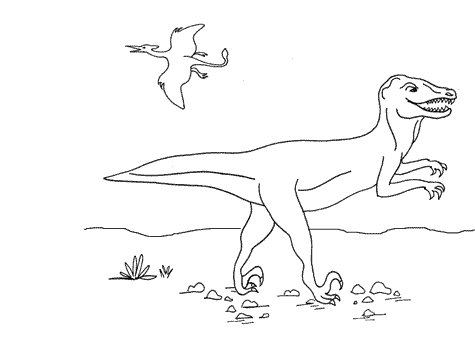 And since she was a very happy dinosaur, she wagged her tail a lot. 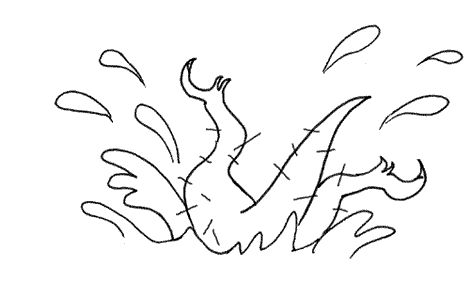 But whenever she happily wagged her tail, anything in its path went flying. Her tail bowled her brothers over. It felled small trees. It demolished the nest of rocks that her parents had built so carefully. Yet Elly usually didn't notice. "I don't see the problem. Now let's play tag!" said Elly. "Let's not," said Kenny. "Whenever you're being chased, you wag your tail." "We could play kick-the-coconut!" suggested Elly. "No, we couldn't," said Benny. "You wag your tail each time you kick. I'm still covered in bruises from the last game." "Then what can we play?" she asked. The brothers thought hard about it. "I know!" said Lenny. "Hide and seek!" So they taught Elly how to play hide and seek. It was a great success. Elly was very good at hiding. And while she was hiding, she kept perfectly still and did not wag her tail. They played hide and seek all morning. Apart from one small accident when Elly wagged her tail and Kenny ended up in a ditch, nobody got any bruises. It was Elly's turn to hide. She found a good place amongst the trees and kept very still. She waited. And waited. But nobody came to find her. After a while, Elly poked her head out to see where her brothers were. "Maybe they've gone for lunch," she thought. She couldn't see them anywhere. But she could see a strange dinosaur sniffing around. Elly lumbered out of her hiding place and trotted over to greet the stranger. She had never met a dinosaur like it. It wasn't an ankylosaurus. It was taller and thinner, with long, strong legs and big, curved claws. The strange dinosaur turned round and grinned a wide, toothy grin. "Well, hallo there!" it said. "Have you come for lunch?" asked Elly. "Oh, I hope so," said the stranger, giving her a still wider grin. It had a great many teeth. "Do you know my brothers?" she asked. "They're around somewhere. We've just been playing hide and seek." The stranger licked its lips. "How delicious - I mean, how delightful! Let's look for them together. Do you know where they'll be hiding?" "Oh yes!" said Elly proudly. "I know all the best hiding places." Elly was so happy to meet this new friend that she nearly wagged her tail. She stopped herself just in time. The dinosaur looked puzzled. "I don't think I have a name." "Well, what do other dinosaurs call you? I'm Elly." 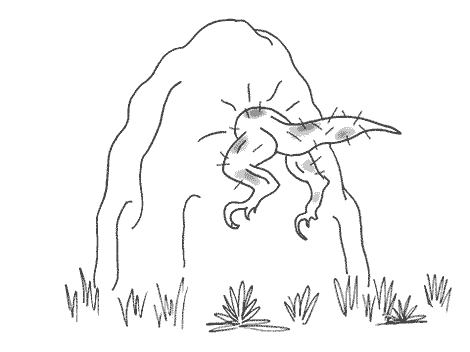 The dinosaur scratched its head with its claw. "I suppose I'm called Aargh!" it said. "At least, that's what everybody says when they see me." "All right, Aargh!" said Elly. "Let's go and hunt for my brothers, and then we can have lunch!" "What a wonderful idea," said Aargh. "I bet I know where Lenny's hiding. Come this way!" Elly trotted off towards the thorn bushes. She was so happy to be playing with her new friend that she nearly wagged her tail. Again, she stopped herself just in time. When they reached the thorn bushes, she could see a nose sticking out. "Found you, Lenny!" she shouted. Lenny sat up and stared at the strange dinosaur. "Oh, you know him, then?" said Elly. "That's good." She was so pleased that this time she couldn't help it. She wagged her tail. There was a whack and a THUD. "Aargh's come for lunch," she said. "Aargh? Where are you?" Aargh crawled out of the thorn bushes. 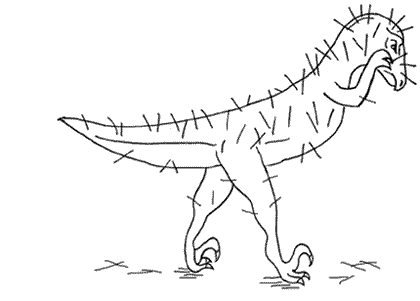 He had hundreds of long, spiky thorns sticking out of his skin. "Are you playing hide and seek in there?" said Elly. "It's a bit prickly, unless you have thick skin like ours! Are you all right?" "Fine," muttered Aargh, trying to pull thorns out of his nose with his long claws. "Let's go and look for Kenny next," said Elly. "I bet I know where he's hiding!" She lumbered off towards the swamp. Aargh followed her, although, for some reason, Lenny didn't. When she reached the swamp, Elly could see an ear poking out of the reeds. "Found you, Kenny!" she shouted. Kenny sat up and stared at the strange dinosaur. "That's right," said Elly. "Aargh's come for lunch." And she wagged her tail again. She just couldn't help it. There was a whoosh and a PLOP. Suddenly Aargh was in the swamp. "That's not a very good hiding place, Aargh!" called Elly. "It's rather muddy!" "You don't say," gasped Aargh as he crawled out of the swamp. As well as hundreds of thorns, he was now covered in sticky black mud. "It's nearly lunch time," Elly told him. "We just need to find Benny. I know exactly where he'll be hiding! Come this way!" She set off again. Aargh followed her, although for some reason, Kenny didn't. Elly waddled happily to the edge of the forest, where there were dozens of huge ant hills. Sure enough, when she got there, she could see a tail poking out from behind the biggest ant hill of them all. "Found you, Benny!" she shouted. Benny sat up and stared at the strange dinosaur. "Yes, isn't it nice of him to play hide and seek with us?" said Elly. She was so delighted that she couldn't help it. She wagged her tail. There was a whop and a SPLAT. Elly looked at Aargh, who was now inside the ant hill. "That's quite a good hiding place," she said, "but I can still see your back legs." Aargh wriggled and squirmed, and at last managed to pull his top half out of the giant ant hill. As well as mud and thorns, he was now covered in angry ants. They scurried all over him, nipping him with sharp jaws. "Ow!" said Aargh. He ran to and fro, trying to shake them off. "Are we playing tag?" asked Elly. She began to waddle after him eagerly. As she did, she wagged her tail. THUNK went her tail against a coconut palm. A shower of coconuts fell on top of Aargh. He tried to kick them away. "Oh, goody!" said Elly. "You're playing kick-the-coconut! I love playing kick-the-coconut!" She began to kick the coconuts at him. As she kicked, she happily wagged her tail. BIFF went the coconuts. WALLOP went her tail. WHEEE went Aargh, bouncing head over heels. "That was clever!" said Elly. "Can you do it again?" And she wagged her tail some more in admiration. "Aargh!" cried Aargh. Waving his claws, he galloped away. "Are we running races now?" called Elly. She tried to race after him, but Aargh ran too fast. She couldn't keep up. Soon Aargh had completely disappeared. Elly was now quite tired and hungry. So she gave up the chase and trotted back to look for her three brothers. "It's lunch time!" she called. Her brothers crept out from behind the trees. "Has that dreadful deinonychus gone?" asked Kenny. "You mean Aargh?" said Elly. "He is dreadful at hiding, isn't he? But he's quite good at running." "We saw you wallop him with your tail," said Benny. "I wish I had a tail like that!" "Me too," said Lenny. "You really showed that dreadful deinonychus a thing or two!" "I showed him lots of games," agreed Elly. "It was fun." She pulled up a mouthful of plants and began to eat. "I think I'll go and find him after lunch," she said happily. "I bet I know where he'll be hiding. I can't wait to play with Aargh again!" 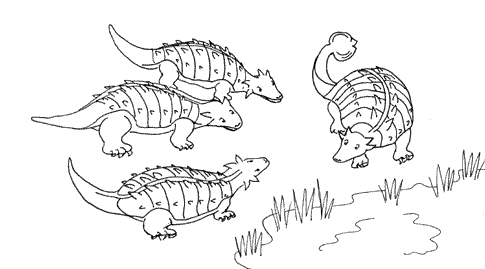 To print this out as a colour-in story book, click here for a pdf version with a picture on every page. Earthshaker or King of the Killers! 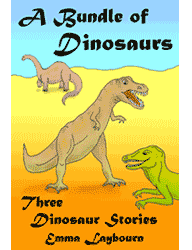 Or you can download all 3 dinosaur stories in one ebook, with full colour illustrations, free from Smashwords, the Nook Book store, Kobo Books or Apple iTunes.